There are a lot of theaters in Chicago. All of them are slightly different but mostly their owned by larger corporations. There are two theaters (in Chicago) I’ve been to that are just interesting in formats and shows. Both The Music Box and Landmark Century Centre Cinema play independent films, foreign, and older films, things you wouldn’t normally find elsewhere. The Music Box can be found in South Port at 3733 N Southport Ave. Which is a straight shot off the brown line or reasonable walking distance from the redline’s Addison stop. Every time I go to the music box it’s usually somewhat towards evening so all of the cute shops in the area or restaurants are closing down. 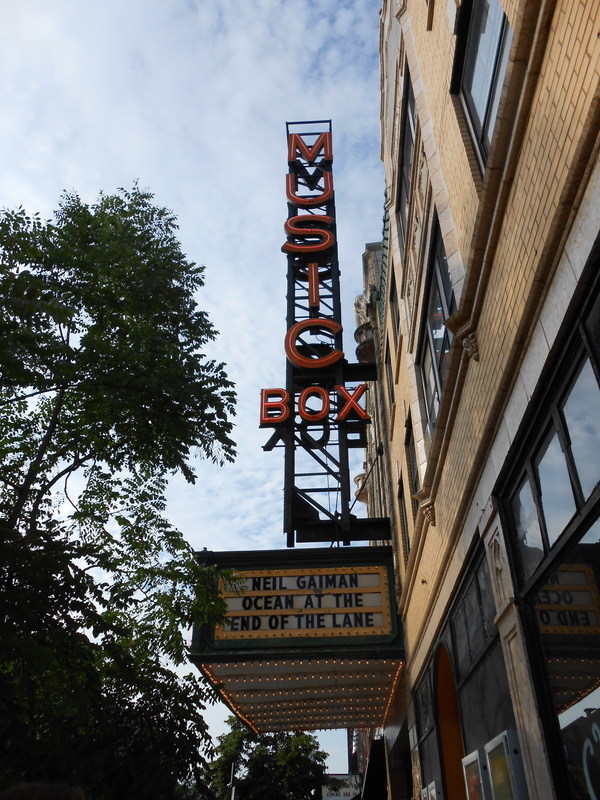 (One was for Madoka Magica which you can find a rather long blog post about under anime/manga) Most recently I was at the Music Box for a Neil Gaiman signing event that was a ton of fun. The Music Box plays a large variety of things in an old fashioned theater. Whenever I go in I’m always struck by the decor, which is somewhat old and fancy yet gives off (for me) the vibe of a setting from a murder mystery or a suspense film. There is almost always plenty of seating for films. Sometimes however it’s best to buy tickets in advanced, especially for bigger events such as one night only films, a new anime movie release or things such as Neil Gaiman’s book signing, because seats can be sold out. Tickets for those events can be purchased on the Music Box’s website. They do film festivals, silent films, Rocky Horror Picture Show nights, and so much more. I’ll find myself sitting in the theater looking up at the ceiling with stars and clouds that make their way across the ceiling and it feels as if I’m about to watch a play set outside rather than a movie. It’s always a fun experience. Landmark Century Centre Cinema was very confusing for me to find at a first. A while ago a friend and I were trying to catch a Studio Ghibli film (Up On Poppy Hill) and it was one of the few theaters playing it. Landmark Century Centre Cinema can be found off the brown line Diversey stop at 2828 N Clark St. Landmark Century theaters can be found elsewhere throughout the US, but this was definably a fun theater to go to. I had trouble finding it because in Chicago it’s located inside a fairly empty mall. The theater is beneath a gym. A couple of the theater rooms are marked with notes saying that the room can shake because of the gym and that if it gets to be too much of a problem people can get a refund. (if they weren’t able to watch the movie to it’s fullness because the screen was shaking). I found the emptiness of the mall interesting, there are a couple of stores but it seemed the biggest thing in the mall was the theater. All of the commercials were for independent and foreign films, or the midnight showings of old movies the theater was going to be playing later. As a person who doesn’t get out to foreign or independent films very often it’s refreshing to see commercials before a movie for documentaries and independent films that I probably wouldn’t have heard of otherwise.